Apple Keynote? What Apple Keynote? I’ve got Chromecast. Google has taken a page from the Apple packaging playbook for Chromecast. Simple, elegant, and small, and that’s just the package the device arrives in. Here are the steps I walked through to get to where I am right now: watching Season 1, Episode 1 of Mad Men from my iPhone on my living room TV. Yes, I’m working at home today. This is my lunch hour. Open the box and see the directions. I didn’t say “read” the directions, because I’m a guy, and I don’t read directions. Google obviously had us in mind, because I could see the entire setup routine at a glance, with one small exception. Install the Chromecast device on my TV. Simple, but not as easy as it sounds. I (currently) subscribe to AT&T Uverse, so I already have one HDMI cable in the back of my Samsung TV. That makes it a tight fit for this device, but after a few tries, I got the device in HDMI2. Download the iPhone Chromecast app…only to discover that you can’t setup the Chromecast from your iPhone. Gotta have the PC. Hmph. Realize that the Chromecast device, in all its elegance, requires power that does not come from HDMI. Google’s good. They never show the USB power dongle in any ad or commercial. No big deal. 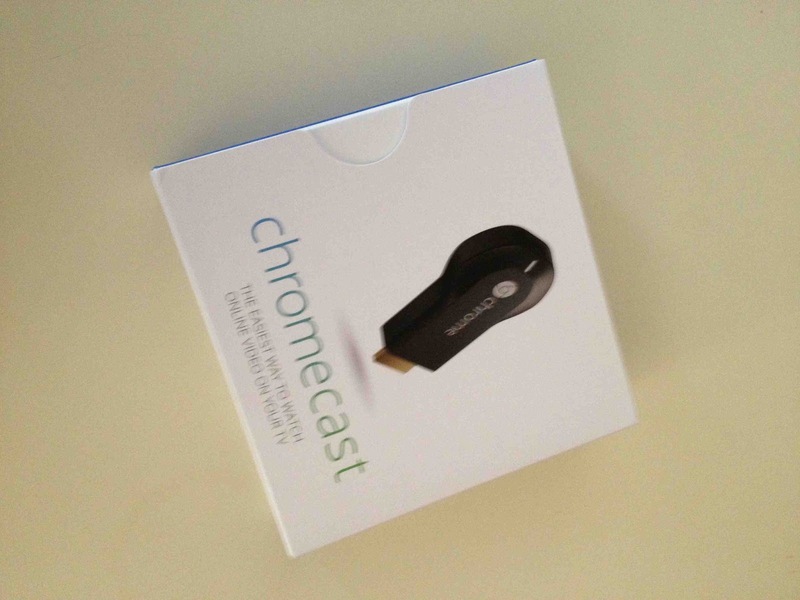 Dig into the bottom of the elegant Chromecast package and find the USB power cord. Remove the Chromecast device from the back of my TV, because I have to remove the plastic tape cover for the USB connection from the Chromecast device. Probably should have seen that before. DOH! Re-install the Chromecast and the USB power dongle on the back of my TV. OK! Now we’re cooking with Crisco! Connect Chromecast to my home Wi-Fi. Check. Download Google Cast Chrome extension. This is interesting: they don’t call it “Chromecast” extension, but rather “Google Cast”, which tells me that Google will be casting lots more stuff, not just Chrome, in the future. Watch simple Chromecast setup video…on my TV, just by clicking the little “Google Cast” button in my Chrome browser. Something tells me they don’t have one of these for IE, but then why on God’s green earth would anyone ever use IE?!? But I digress. Get bored with simple Chromecast setup video, and immediately search YouTube for Big Daddy Weave’s “Redeemed” video. BOOYAH! Try the same from my iPhone. Check! Start 30-day free trial of Netflix. Yes, that’s correct: it’s 2013, and I am just now signing up for Netflix. Don’t judge me. TV is not that huge a priority at the Sandlin home. Hence this entire procedure for removing cable TV. Watch Mad Men Season 1 Episode 1 from my iPhone on my TV, less than 5 minutes after walking in the door from the mailbox with my Chromecast device. Fifteen steps? Couldn’t be that many, but it took nowhere near as long as that seemed. Chromecast is just exactly the device I needed to begin the serious move towards telling AT&T Uverse what to do with their $120/month cable bill. Netflix: $8/month. HuluPlus: $8/month. Chromecast: $35. That, my friends, is what we call a no brainer. That said, I do still have some questions: when (not if) I cancel Uverse cable TV, how will I watch LIVE TV, mainly sports, without cable TV? That question’s mine. My wife’s question, from Seinfeld, because she wants to know what else is on TV, is how will we know what else is on TV? I think the answer is “everything” is now on TV, but that leaves the question, how do we find it all? Live and learn. Try something new. Chromecast is highly recommended for both. TitanTV. You can program it for your broadcast stations – if you are using an antenna. TitanTV has a way to set up calendar reminders for shows you want to watch, offers a "favorites" function (up to 200), custom channel line-ups, and even give you a description of the tv show if you hover over it. Also, TitanTV works for cabel and satellite and dish, too! Previous PostPrevious No such thing as "Work Life Balance"